Finding your pointe shoe match isn't the only component that affects your dancing. Smaller, but arguably just as mighty, is the padding that goes inside. Here's what four pros have found works for them. 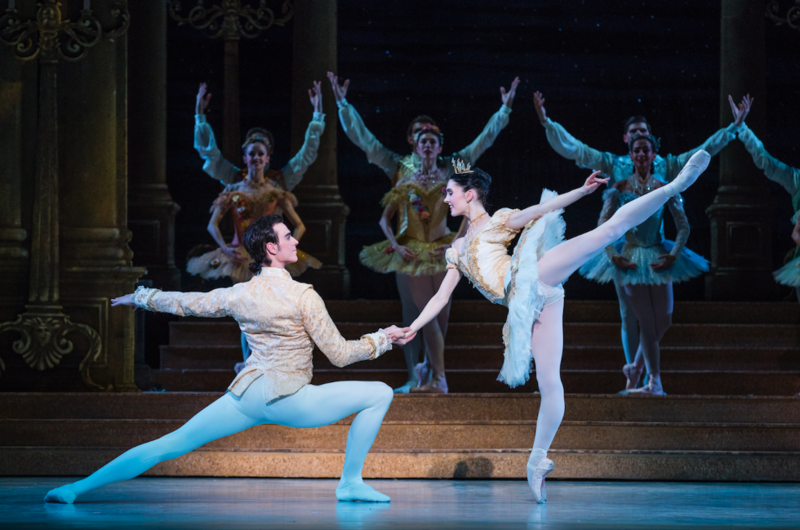 Beckanne Sisk and Chase O'Connell in Ballet West's Cinderella. Photo by Beau Pearson, Courtesy Ballet West. "I use whatever paper towel they have in the restroom of wherever I am," Sisk says. "I fold them in half and then tear it down the middle. Then I take an end, fold it to the middle and wrap it around my toes," she explains. "I couldn't feel the floor with toe pads, plus they would start to smell so bad!" Eri Nishihara in Gargoyles by Philip Neal. Photo by Sarah Ferguson, Courtesy Richmond Ballet. "I cut regular cotton socks straight across just below my bunions. I'm not picky about the socks I use as long as they are not too thick," says Nishihara. "I have very wide feet, so this covers all of my toe joints without adding bulk, and I find that it allows me to have a better connection to the shoes and the floor. I also have many pairs so that I can switch them throughout the day to keep my feet fresh and dry." Perry in George Balanchine's Four Temperaments. Photo by Reed Hutchinson, Courtesy Los Angeles Ballet. "I used to use just a few paper towels in my shoes, but for longer ballets with little time to switch out disintegrating paper towels, I've switched to Bunheads' Ouch Pouch toe pads," Perry says. "For aches and pains in the shoe, I'll put 2nd Skin Squares on a hot spot and tape around my toe to give it a little extra cushion." Dorger. Photo by Claus Vedfelt, Courtesy Royal Danish Ballet. Choosing a newer take on pointe shoe padding, Dorger swears by the customizable molds from PerfectFit. The inserts last around six months, but she likes to rotate three pairs so that she always has a backup. To make the inserts, Dorger combines a third of the white moldable putty with a third of the turquoise, spreading the mixture over the tops of her toes. Once she places the fabric cover and plastic over her feet, Dorger puts on new pointe shoes and does relevés for several minutes as any excess molding squeezes its way out of the top of the shoe. After they've set, she cuts away the extra molding as well as the section that covers her big toe. "It's probably bizarre, but I don't feel that I need any extra protection on my big toes," she explains. "But don't be afraid to play around a bit to really figure out what works for you."